I am spending two weeks in Dahab, on the Sinai coast in Egypt, which is one of my favourite places in the world. I’ve decided to blog about it while I’m here, giving you a daily insight into the town and its inhabitants. I arrived last night at the wonderful Sheikh Ali hotel. It’s run by a Bedouin family and it has their trademark hospitality. The rooms are huge, clean and their beds are the comfiest I’ve ever slept on. There is a brick cupola in the ceiling that can be lit as a lovely nightlight, if you need one. Anyway, I spent my first evening catching up with a friend in Crazy Mummy restaurant (formerly Funny Mummy), on the look-out for Bufra, the infamous restaurant dog. She didn’t make an appearance, but her progeny are everywhere. 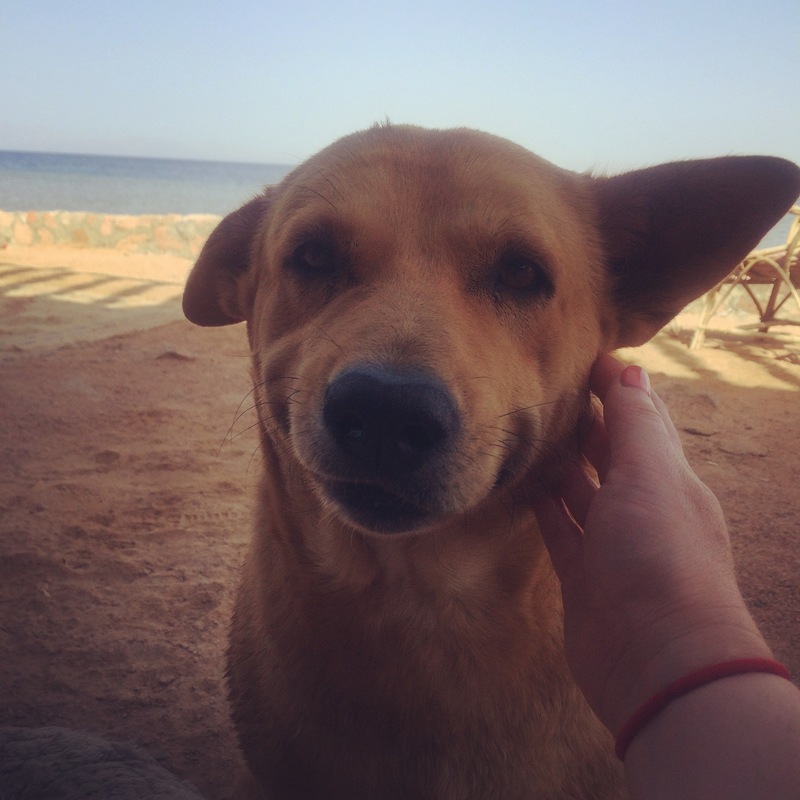 My friend tells me that most of the Dogs of Dahab (as I call them) are related to her. She’s like the Barbara Windsor of Mashraba (the area south of the bridge). The town is 50 miles north of Sharm-el-Sheikh and is most famous as a windsurfing and diving destination. 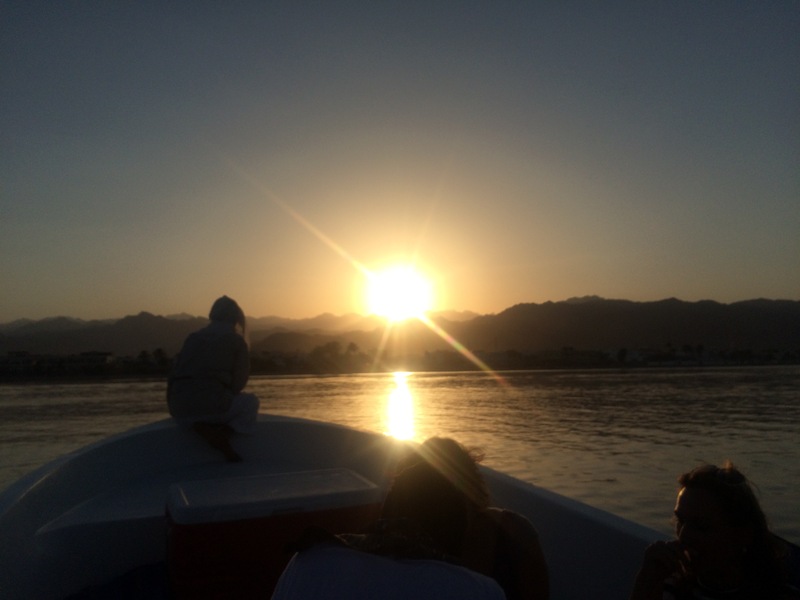 Its popularity grew as Sharm became bloated – Dahab offers a much more peaceful retreat. It is backed by the glorious Sinai mountains and fringed by golden sands. Watching the sun slip behind the mountains has to be one of life’s greatest pleasures. However, the tourism here has been hit by a downturn since the three bombs that went off here in 2006 and then again by the Revolution in 2011. It’s struggling to get back to its former glory. Tourist fears of terrorism are currently rife, exacerbated by recent attacks in other North African and Middle-Eastern countries. Everyone I’ve met here who works in the town talks animatedly about the town’s former buzz. Teeming restaurants and cafes, plentiful work and tourist money – a town in the prime of its life. 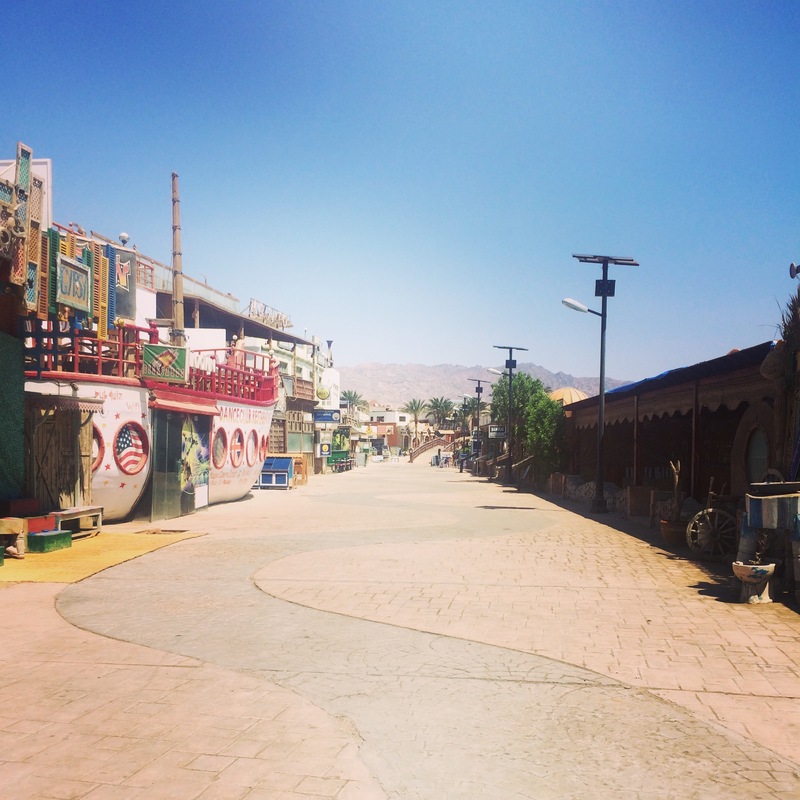 I’ve only known Dahab in the last three years and I can see the devastation that the terrorist threat has caused. Although Russian tourists in particular are still coming to the area, the town is fringed with half-built hotels and apartments, and half-closed restaurants and cafes are a regular feature. 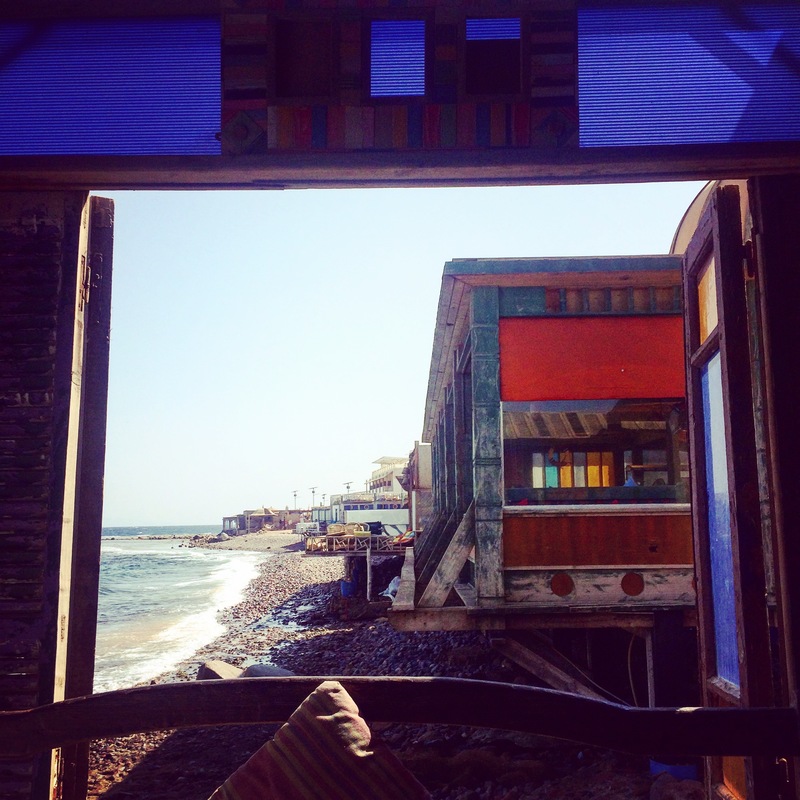 It makes me so sad to see it because Dahab has a magical feel like no other place I’ve been to. 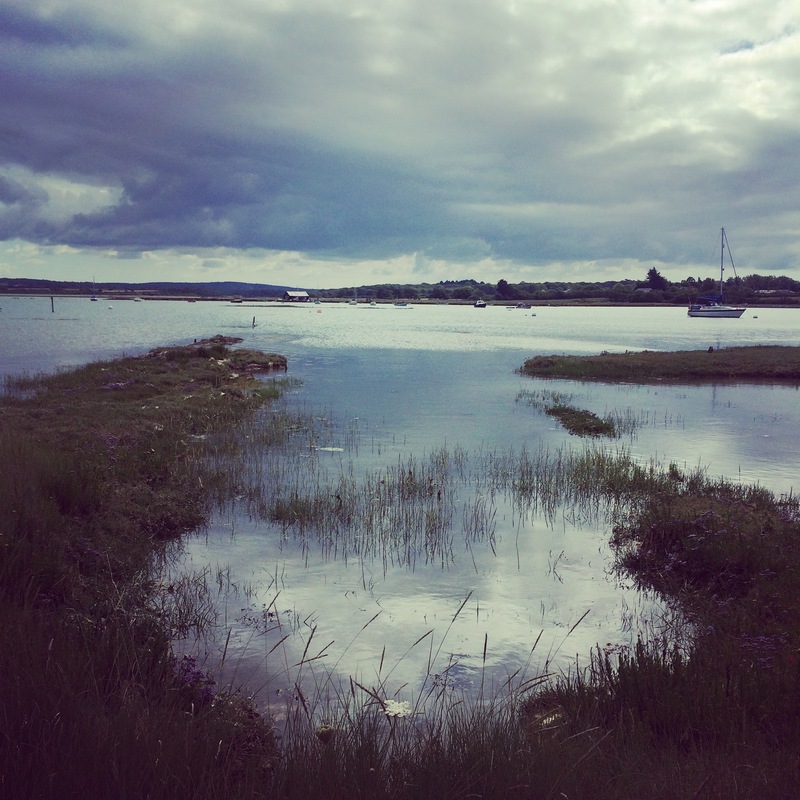 Well, maybe certain coastal towns in west Wales or Ireland – it shares an other-worldliness with those places and a sense that anything can happen as long as you sit and wait for it. Time slips away while you are staring out over the Gulf of Aqaba. My friend was working in one of the restaurants close to one of the bombs and he told me about the day it happened, and the devastation he witnessed outside. He also told me about the brief few days of freedom following the Revolution and how that was quickly curtailed. He, and all his friends, are still trying to make a living, but many have moved away, usually with foreign girlfriends or wives who can offer them opportunities outside the town. But they always say that they would never even think of moving if they could earn a decent living here. Conversely, non-Egyptians are moving in, working in the dive centres and the restaurants, attracted by the laid-back lifestyle of Dahab and its hypnotic draw. I said ‘the grass is always greener’ to my Egyptian friend – a new British phrase for him to learn. There must be an Arabic version of that, involving sand or something. We got to talking about the loneliness of living in a town, even though you’re surrounded by friends; of the importance of an ‘in case of emergency person’ – a ‘loved one’ who will always have your back. I was struck by the fact that we’d both been musing on the same thing in our respective countries, living away from family and friends who’ve moved away, and having friends who have other ‘loved ones’ who are more of a priority than we are. Who are my loved ones? We’ve both asked ourselves this same question. And then there’s the safety-net thing. I’ve long been aware that I live a safety-net-free life. No one’s there to bail me out, there’s no mega trust fund or wealthy relative to step in just when I need it most, and I’m not a saver. I live for the day, because I might not be here tomorrow. My friend lives in the same way, but it’s enforced, because there really isn’t another way for him. One thing that always strikes me every time I come to Dahab and meet more and more of its residents is how we are all basically the same. People living a life in a place. Some of us luck out in terms of opportunity or wealth, some of us make it happen. For some it refuses to happen despite their best efforts. 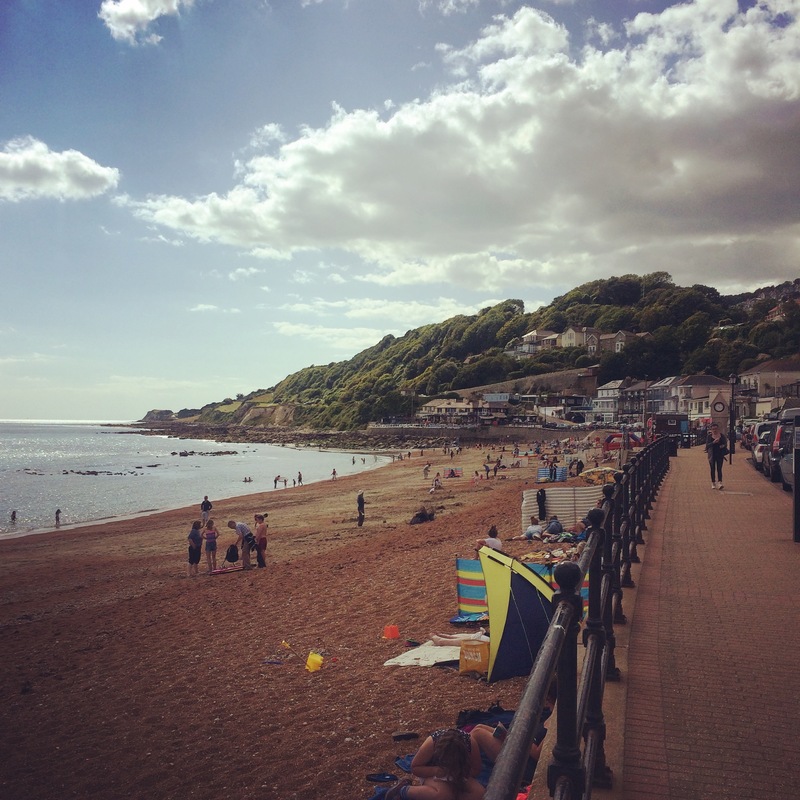 Apart from last night’s glorious experience at Cantina, Ventnor wasn’t really appealing to me at first. But after a good night’s sleep and with blisters under strict control, I found it all so much more impressive in the morning. 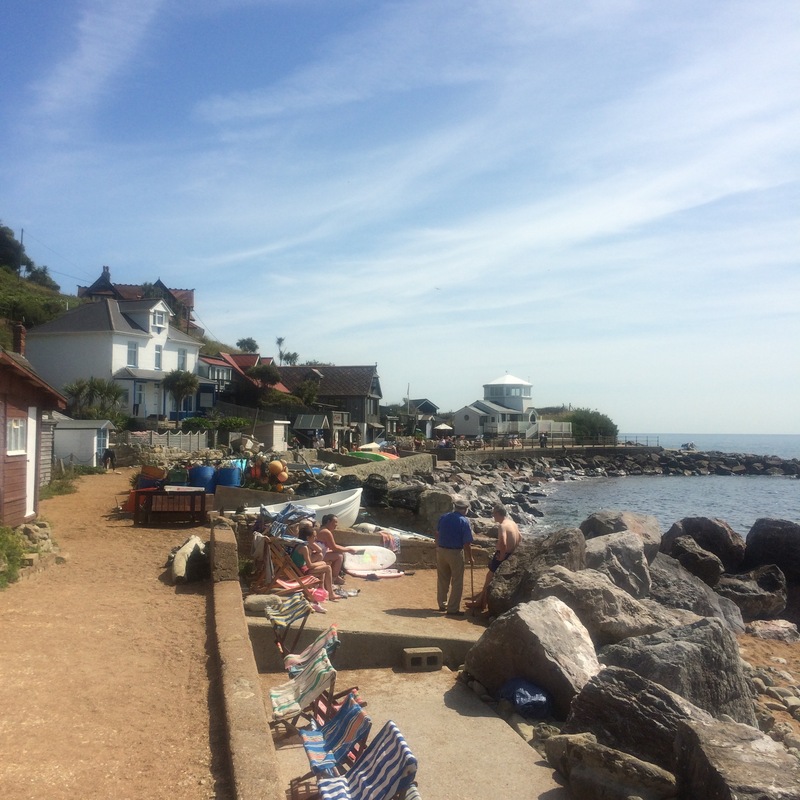 I decided to go back to the coastal path and made my way to Steephill Cove – a place that has been recommended to me by so many Wight lovers. I can see why. A strand of higgledy coffee shops and surf shacks line the cove, and when I arrived there it was bright and quiet. Here’s my Periscope. A coffee at the Beach Shack at the end of the strand has to rank as one of the best experiences of the trip. They have a bar with stools that overlooks the sea – it’s ridiculously beautiful. 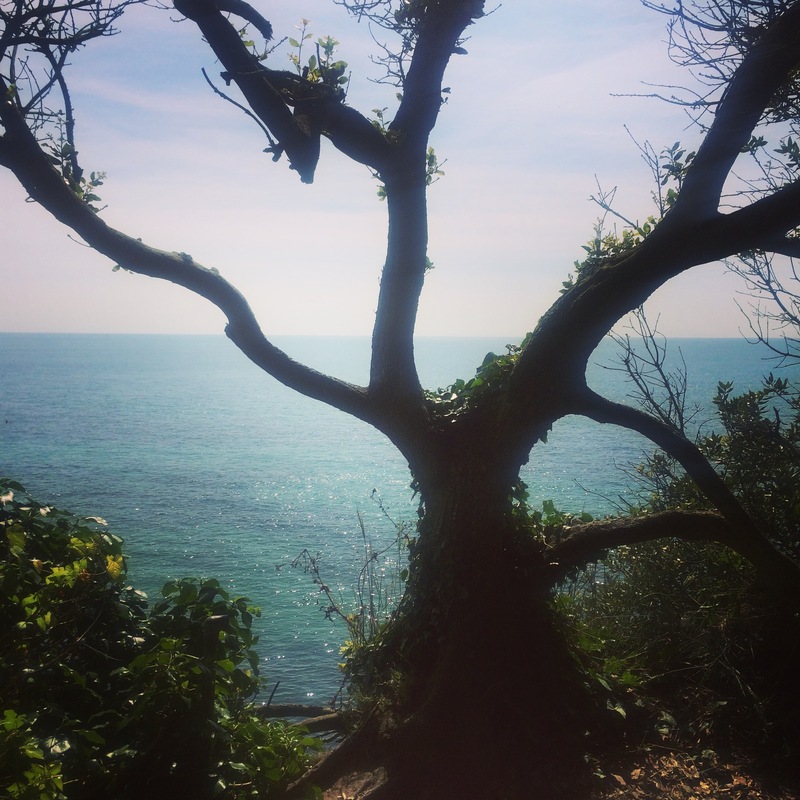 Then it was further up the coastal path to Ventnor Botanic Gardens. Don’t make the mistake I made and go for the official entrance – I now realise I could’ve got in quite easily round the back of the gardens straight from the coastal path. An unnecessary circuit on still-fragile feet. 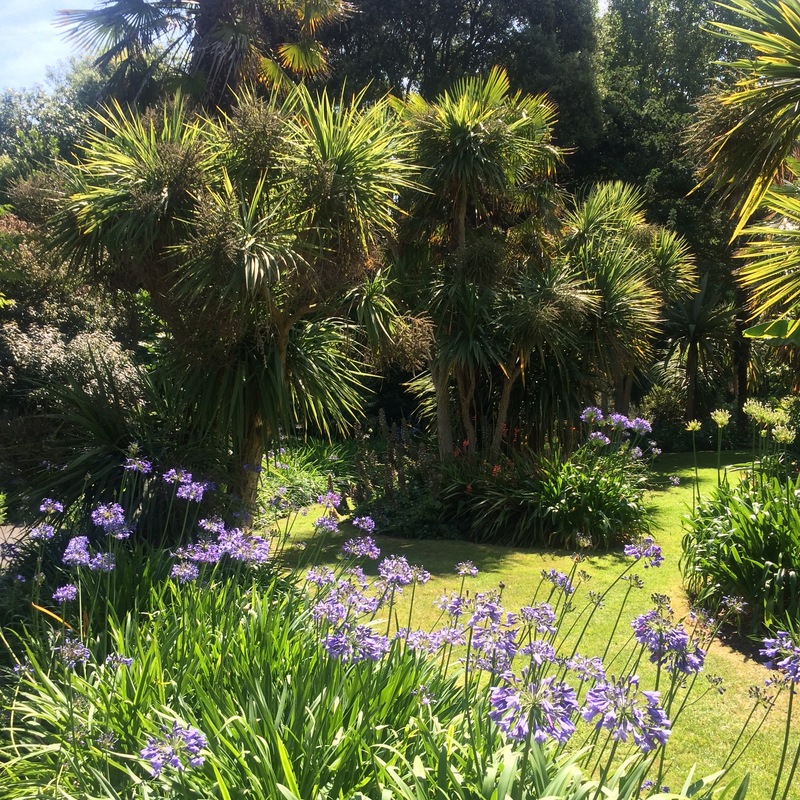 After the relative wildness of the coastal path and Steephill, I found the gardens all a bit too manicured and ‘curated’. 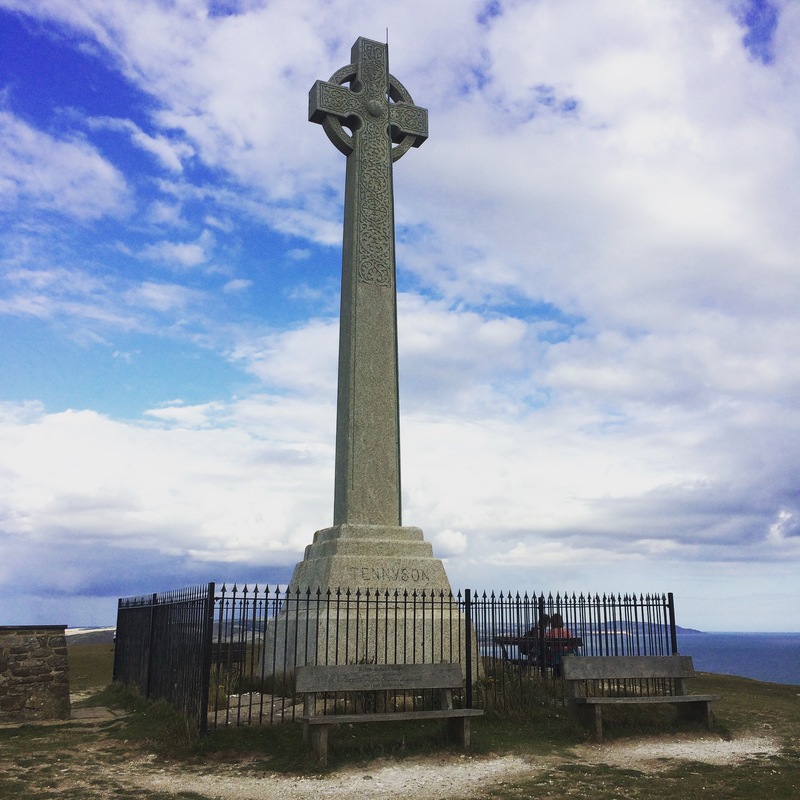 I’m afraid I pretty much whizzed around it (after using the wifi in the café – no signal at all in Steephill) and got back to the coastal path as quickly as possible. And so to Crab Shed for lunch, home of the crab pastie. I managed to grab one of the little tables at the front of the place, which is only open 12pm to 3pm but is oh so popular. 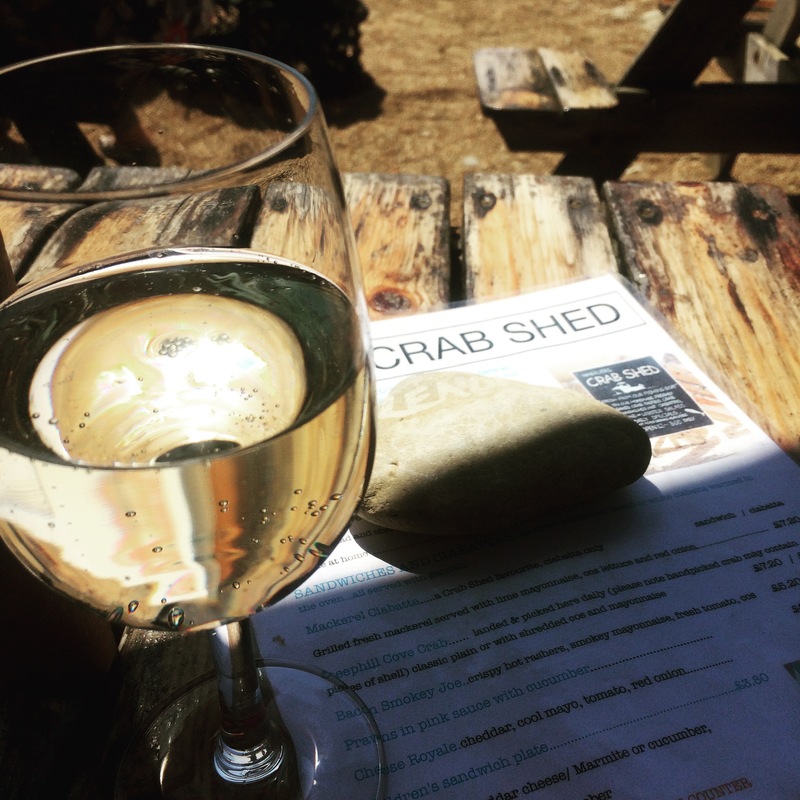 They were offering prosecco with their crab – and who was I to turn that opportunity down? I hopped back to the Beach Shack for another coffee and a read of my book, but I did feel self-conscious among all the (very middle-class) families there. 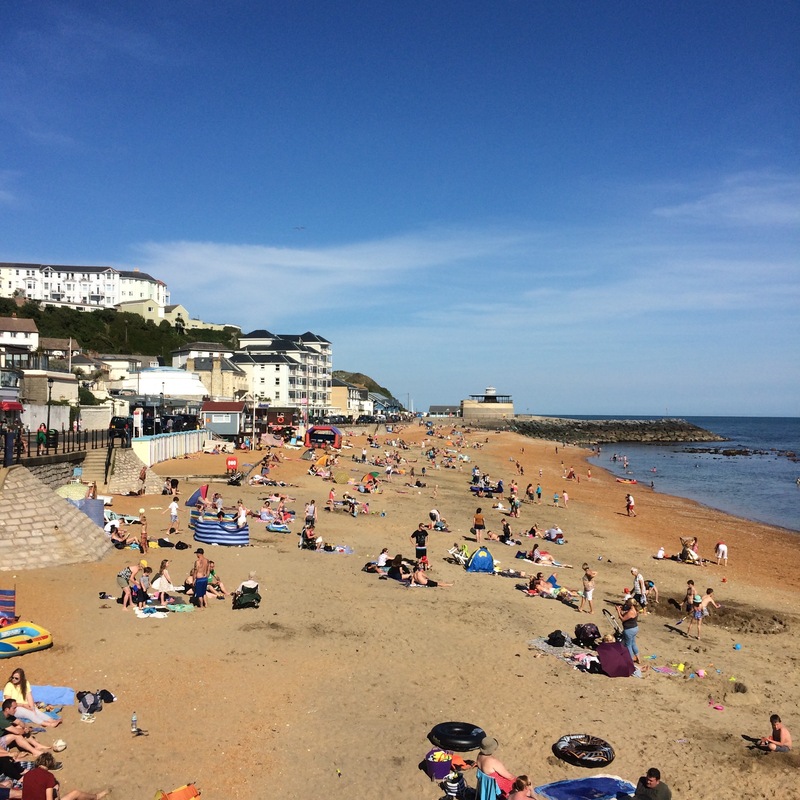 I felt much more at home among the masses by the main beach at Ventnor in the end, despite Steephill’s impressive strand. I’d love to go back there with a friend. I boarded a bus bound for Ryde which took me through the attractive old town of Shanklin and then Sandown. Of course, I should’ve walked through both towns, but sadly my feet weren’t up to it. 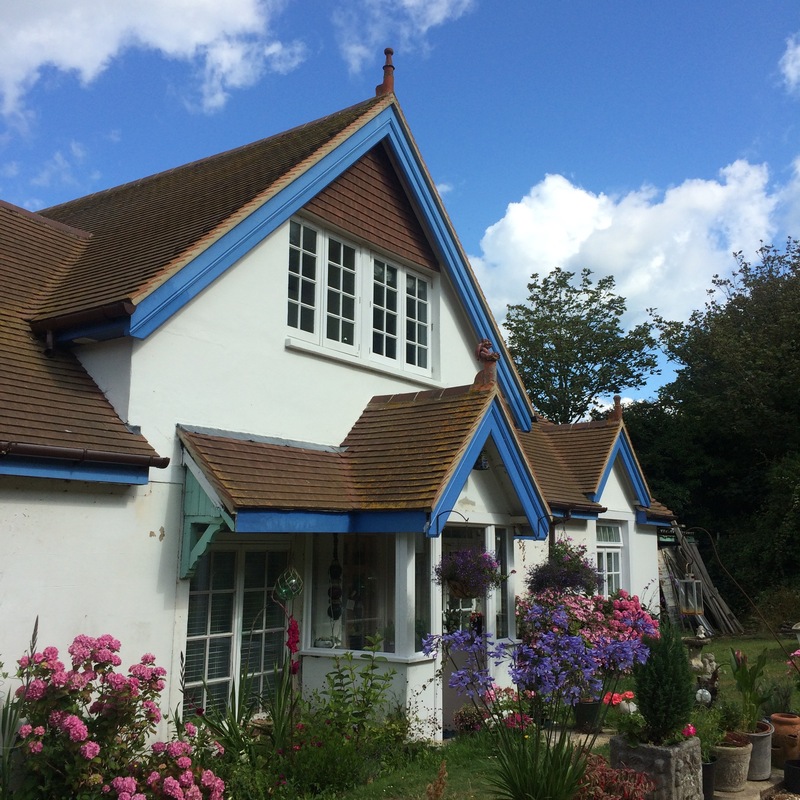 And so back to Ryde, into the welcoming abode of Joan and Brian, where I started my journey. 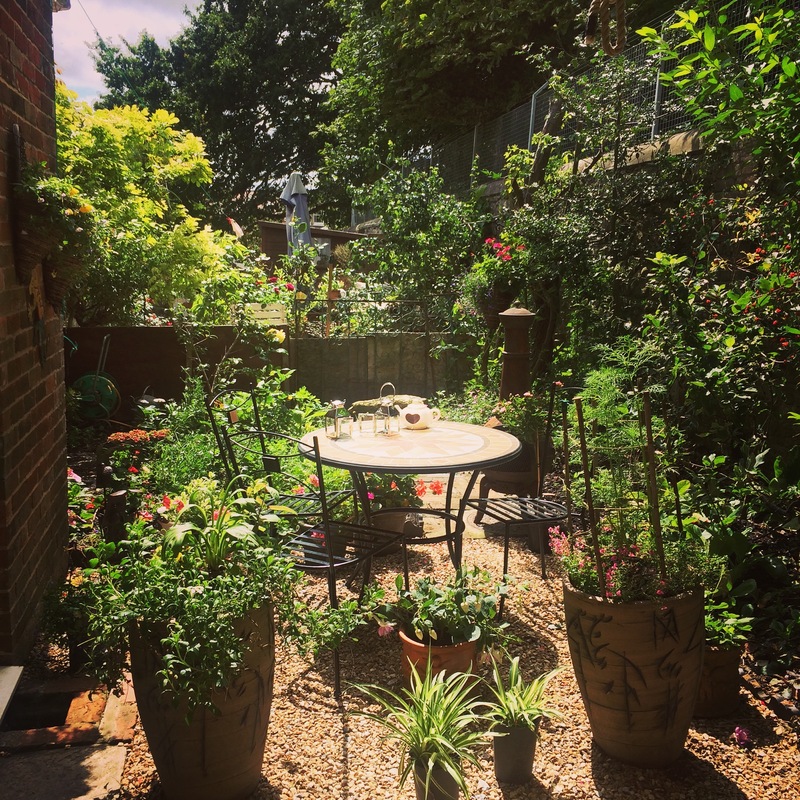 It’s funny how quickly you can bond with people – I really looked forward to seeing them at the end of my journey and they told me they’d been following my blog. It’s funny how these trips always come down to the people I meet. Mary, the mad cyclist, Clare the Chinese blogger, Christophe the German runner, and John White the walker. And all the B&B owners: lovely Joan and Brian with their granddaughter Eva, Rowena who picked me up in Shalfleet when I was half dead, and Sue and Joe with their pet seagull, Ziggy, in Freshwater Bay. 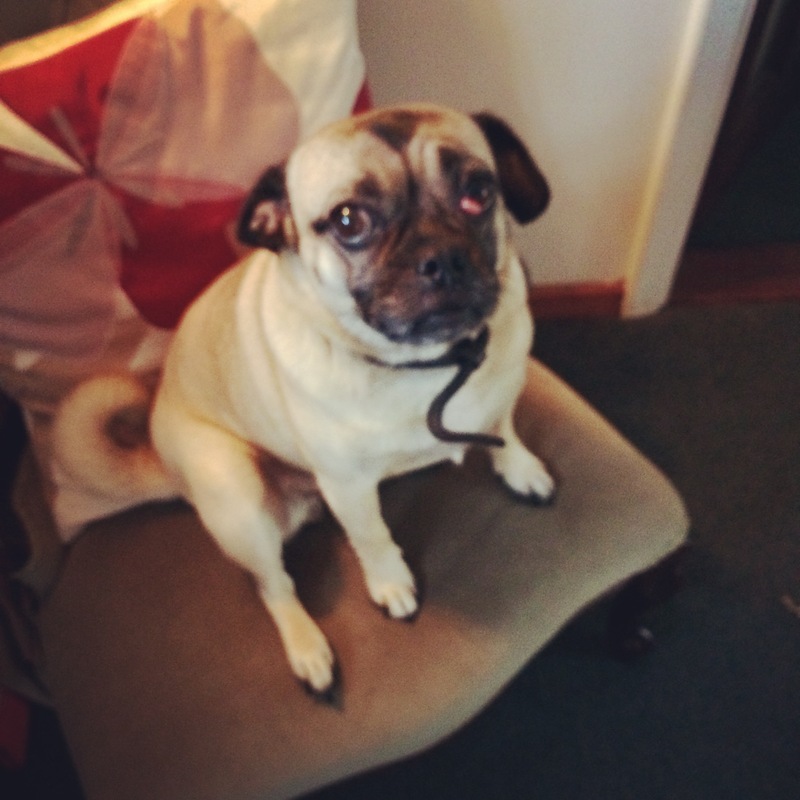 And then all the dogs and other animals I’ve met – too numerous to list here. So this is the end of the trip, barring the hovercraft from Ryde in the morning. It didn’t quite go to plan, but there again, I think that plans are sometimes meant to be broken. And there will always be kind strangers there to help you out when that happens. Hope you’ve enjoyed it all as much as I have – let’s do it again some time. Well today was unexpected. In good and bad ways. This was the day when I had to stop walking due to Blistergeddon and ‘pivot’ into a totally different trip. 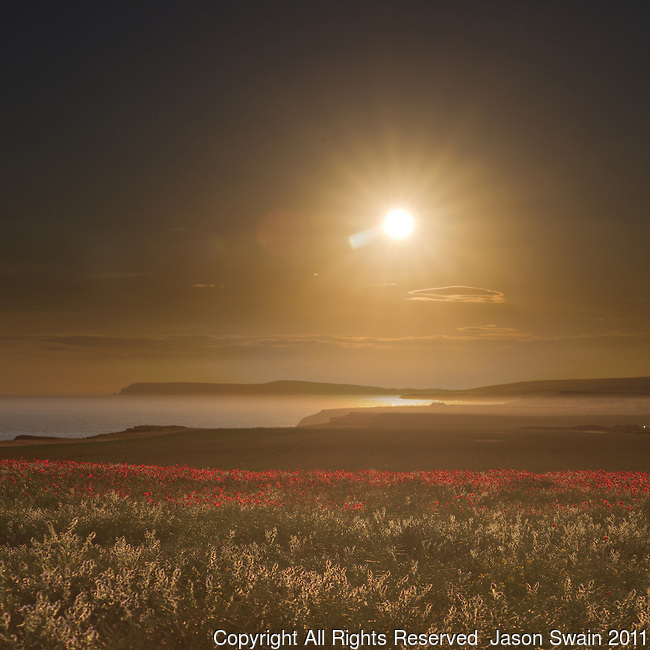 Freshwater Bay isn’t exactly a terrible place to explore or chill out in so at least that timing was good. Here’s my Periscope of it. Before I left the wonderful Pen-Y-Bryn (I can’t recommend it highly enough), landlord Joe let me watch him wake up their pet seagull, Ziggy. Here’s my Periscope of it. 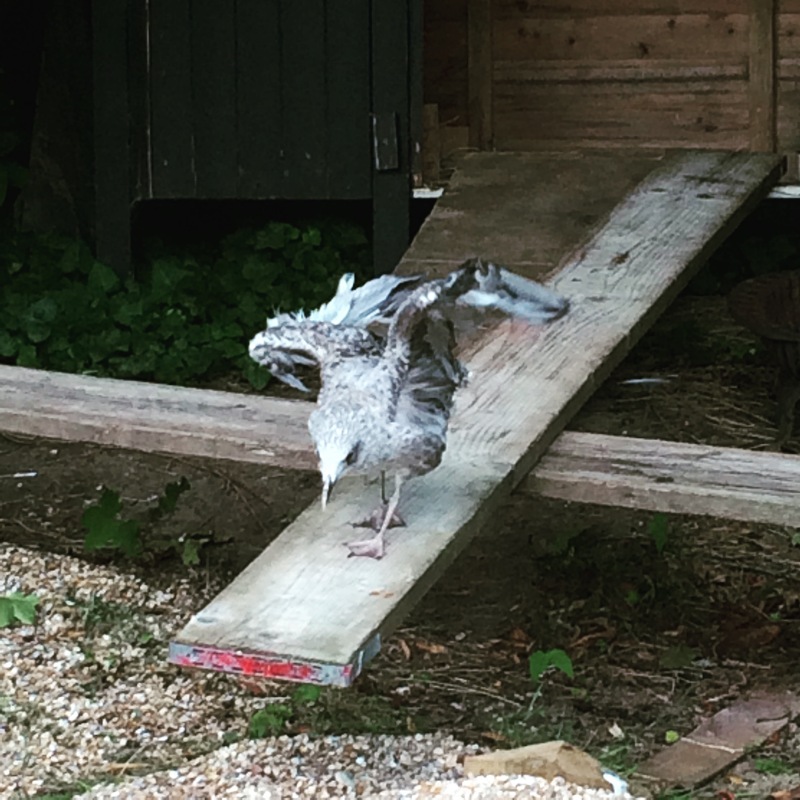 Ziggy is a herring gull who hatched just down the road from the property, but couldn’t fly due to a deformed wing. Sue and Joe now keep him as a pet, and he sleeps in a rabbit hutch to keep him safe from foxes and buzzards (he’s already been attacked by both). 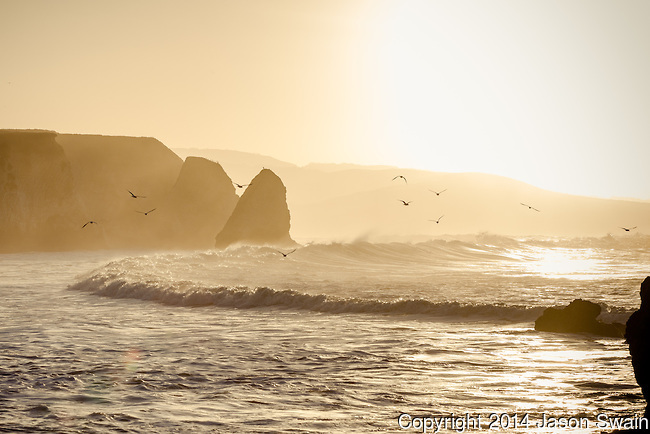 I loved the story of them carrying him down to the sea at Freshwater Bay and him having a nice wander around the beach. Apparently gulls are very territorial, approaching the same fishing boats and perching on the same roofs. Ziggy regularly ‘talks’ to his folks on the neighbouring rooftops. Dimbola Lodge in the Bay was a revelation. I had no idea that the area had been a magnet for Victorian ‘celebrities’ lured by Tennyson and his Freshwater ‘set’. 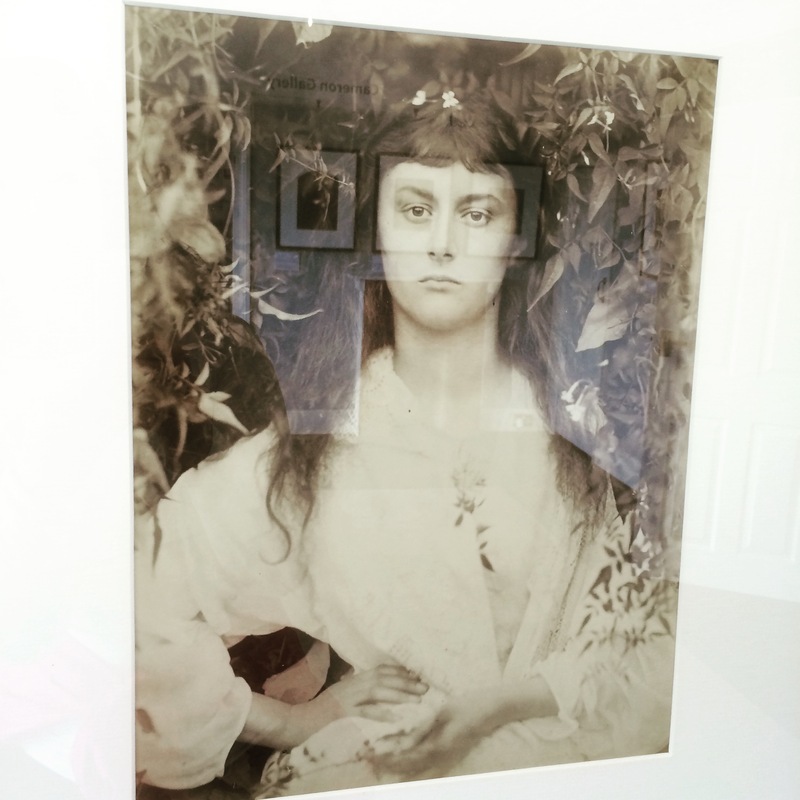 Dimbola had been the home of Julia Margaret Cameron, a Victorian woman who turned the Victorian passion for celebrity into a career, taking photographs of them in her beautiful home. Among her models were Tennyson himself and Alice Liddell, who would become the muse behind Alice’s Adventures in Wonderland. JMC had been given a camera as a present from her children when she was forty-eight. During her lifetime she was accused (presumably by men) of being amateurish, unprofessional and unworthy of her celebrity subjects, or of an exhibition space. 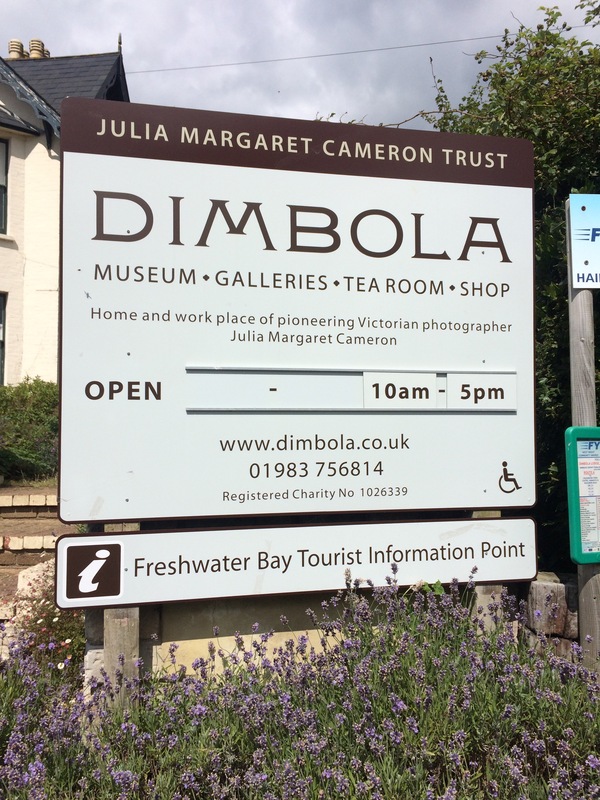 I’m so pleased that she is now getting the recognition she deserved then – Dimbola is a wonderful place to visit, and had I not had Blistergeddon I would never have gone there. 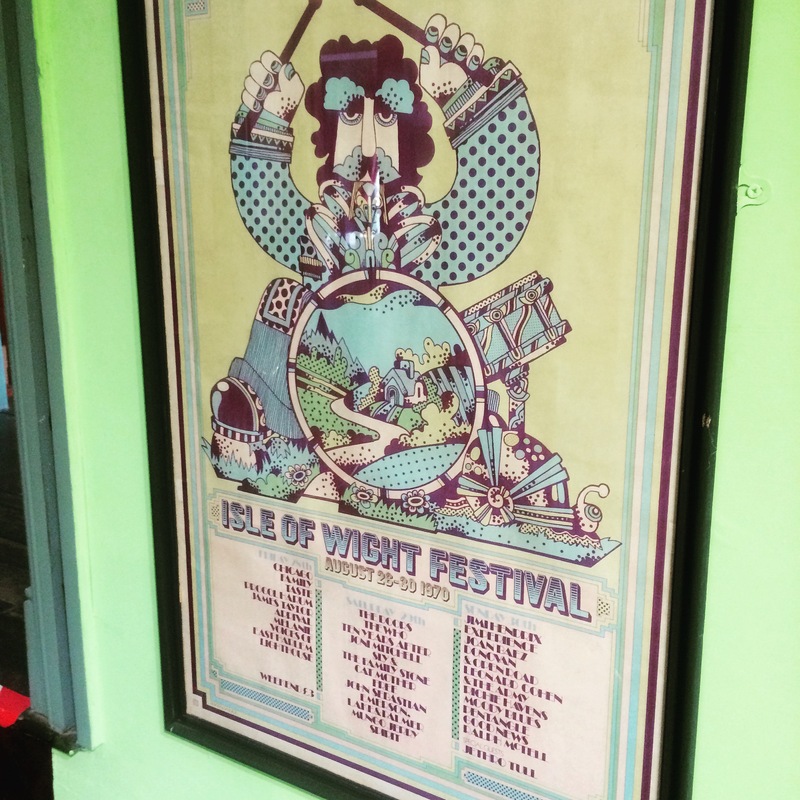 It’s currently showing a great exhibition about the seminal 1970 Isle of Wight Festival, complete with Jimi Hendrix garden. Fantastic memorabilia of that world-class line-up. After a slightly terrifying vertiginous bus drive to Ventnor, I discovered that the shoe shop I’d planned to buy comfy shoes from was shut so I decided to use a wine spritzer at The Mill Bay as a method of pain relief. It worked. Enough to see me through popping them all and treating them with spray plaster, anyway. And now to the much-lauded Cantina for dinner. The owner is bringing me aperitivo as I type, along with a gorgeous Elderflower Mojito Frizzante. I’m sitting in a pub called the Horse and Groom in a village called Shalfleet, which is (allegedly) 16.7 miles from Ryde. 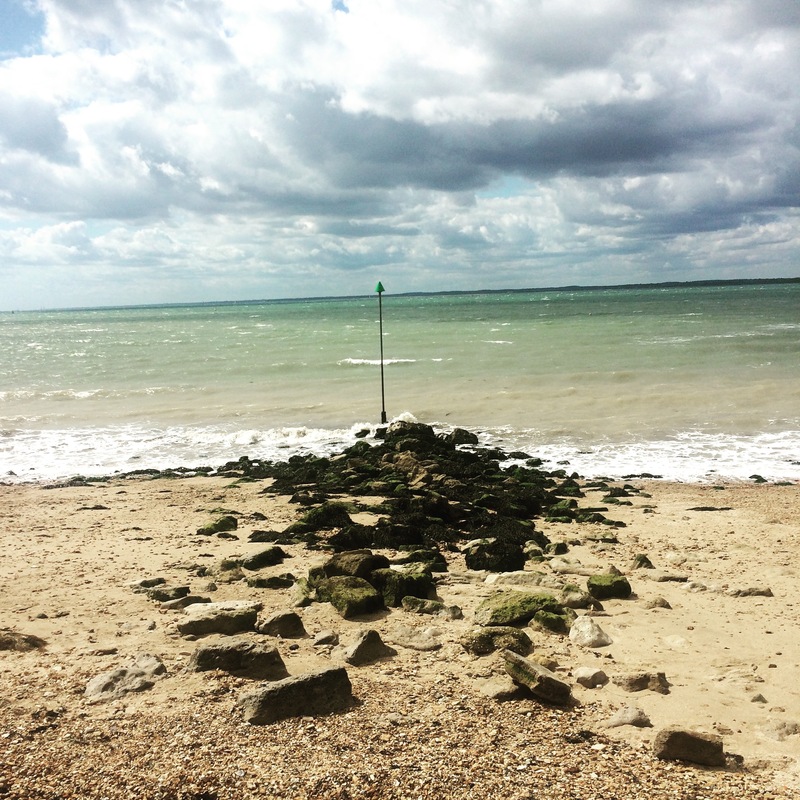 My feet are throbbing and aching under the table, testament to the extra eleventy one miles they added because of a diversion inland, due to coastal erosion at Gurnard. I think I’d rather have risked a cliff falling on me. What I expected to be a quick detour inland actually turned out to be a whole heap of extra mileage, and at 16.7 miles, the walk was already at the limit of my capabilities. And I’d decided to stop off to see Osborne House, Queen Victoria’s holiday home (at least an extra couple of miles). And I got lost in Thorness which saw me going in a complete circle, thanks to a girl who was so sure the coastal path was ‘just up there’. It was ‘down there’. Anyway. The question tonight is whether or not I’m going to continue tomorrow? I’ve got blisters – one big one on my right inside heel and under my third toe (weird). I’ve burst them in the hope they will be ‘aired out’ overnight and then Compeed will save me. I’m wearing Merrell cross-trainers – they’ve never given me blisters before – but even they were unable to cope with the strain of today. Really pleased with my Fabletics outfit and North Face jacket though (they’re not sponsoring me). There were so many good things about today. A full English breakfast to start the day followed by a ‘send off’ from Poppy and Heidi – two spaniels resident at San Remo B&B. Then met at the other end by Mia and another Heidi, resident at Brookside Farm Cottage B&B. 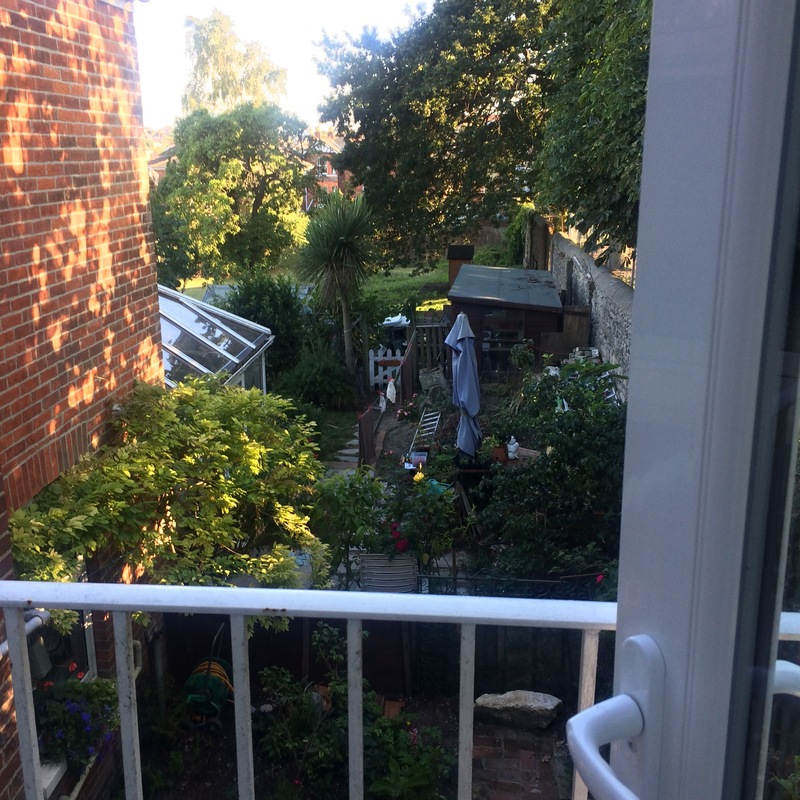 My many encounters with Mary – the woman who is cycling the same route as me, but can’t seem to be able to follow the path. She passed me three times before Cowes, unable to comprehend that I was walking ahead of her. She made me laugh – no doubt we’ll meet again before the trip is through. 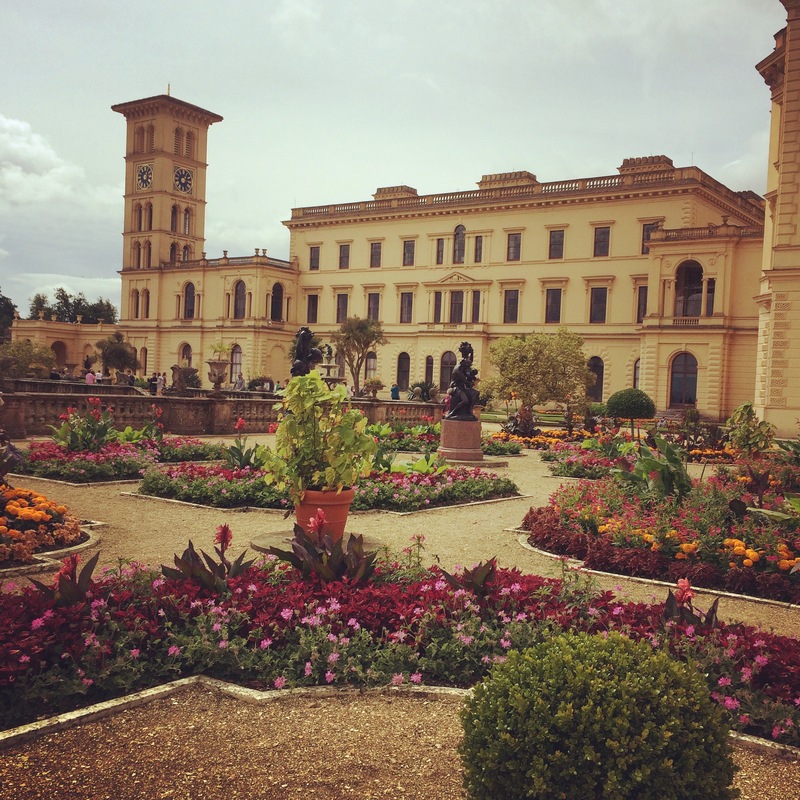 Then the glory of Osborne House, an absolute jewel in the crown. I just had time to wander around the gardens (you only have to pay to get into the house, I discovered) and I’ll definitely be going back. The little chain ferry that links East and West Cowes and costs 40p. Apparently fares have only just been introduced and the locals are outraged. 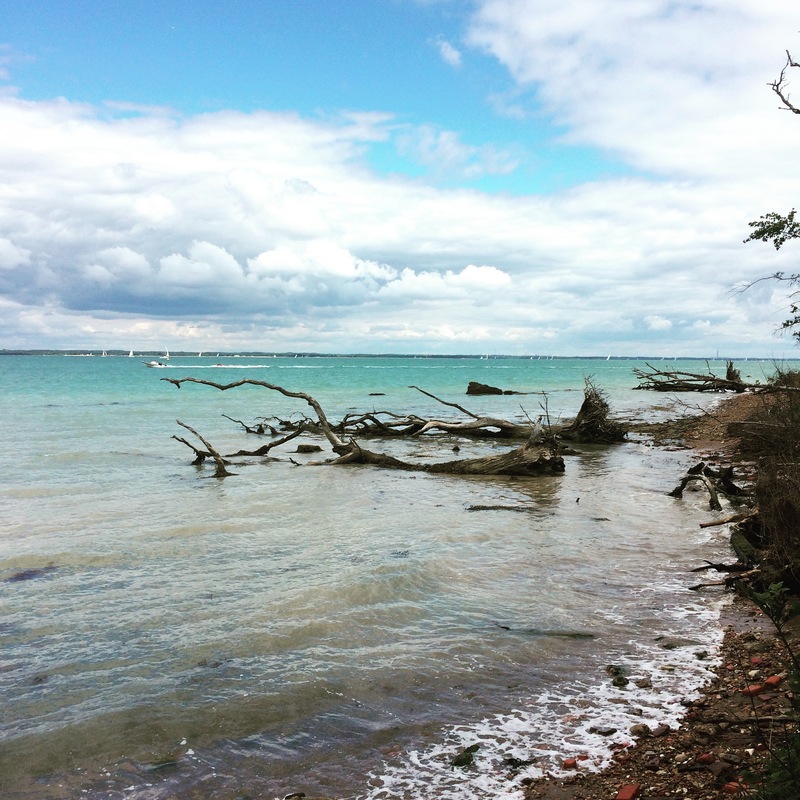 In an Isle of Wight, really-quite-nice-actually way. 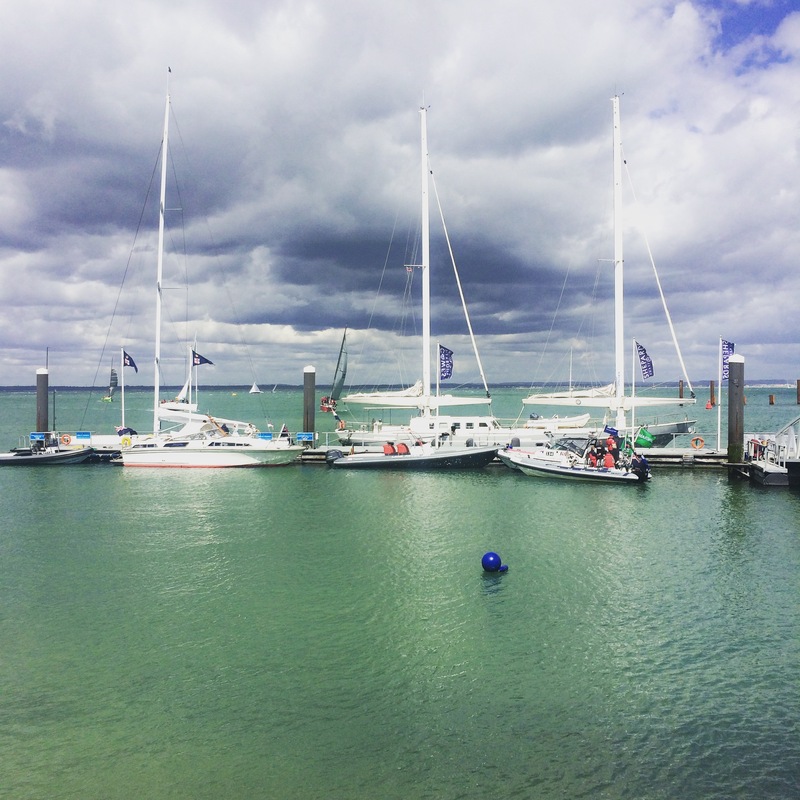 And lunch at the Well Bread Bakery in Cowes followed by the insta-glamour of Cowes marina. It literally took my breath away with it’s blustery charm, gun salutes, and outrageously green waters contrasting with white boats. Here’s my Periscope. 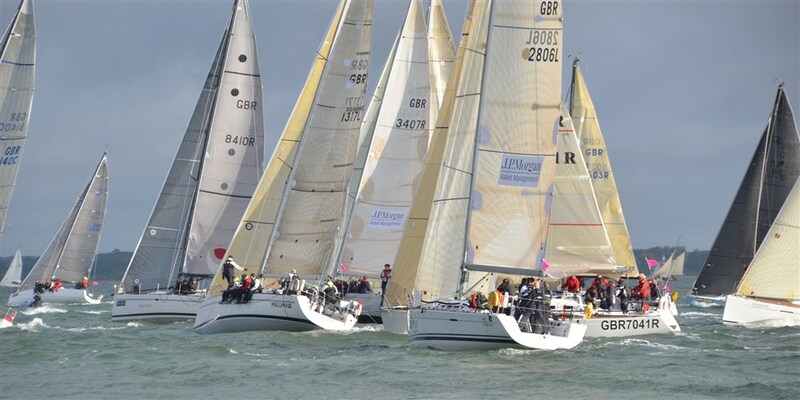 I set off from Cowes, the half-way mark, with so much joie de vivre, mainly brought on by a huge coffee and a massive focaccia baguette containing emmental and ham. 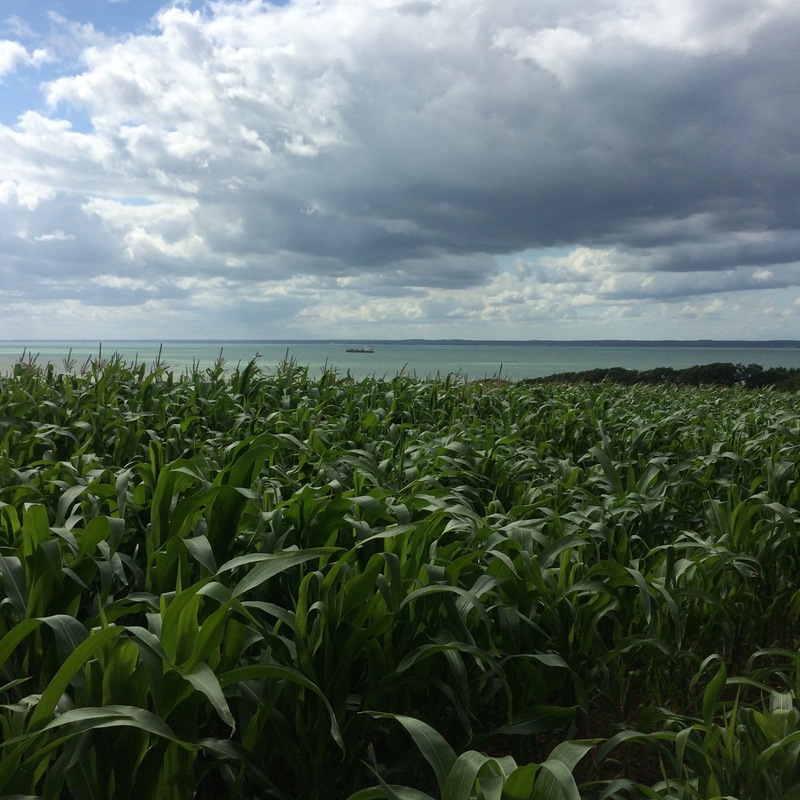 The diversion away from the coast did exhaust me, but even during my lowest point, I was able to laugh about going from Cowes to cows, as I passed a big beef farm en route to Shalfleet. No actually walking yet, other than exploring a bit of Ryde, but I’m here in the Isle of Wight for the very first time. 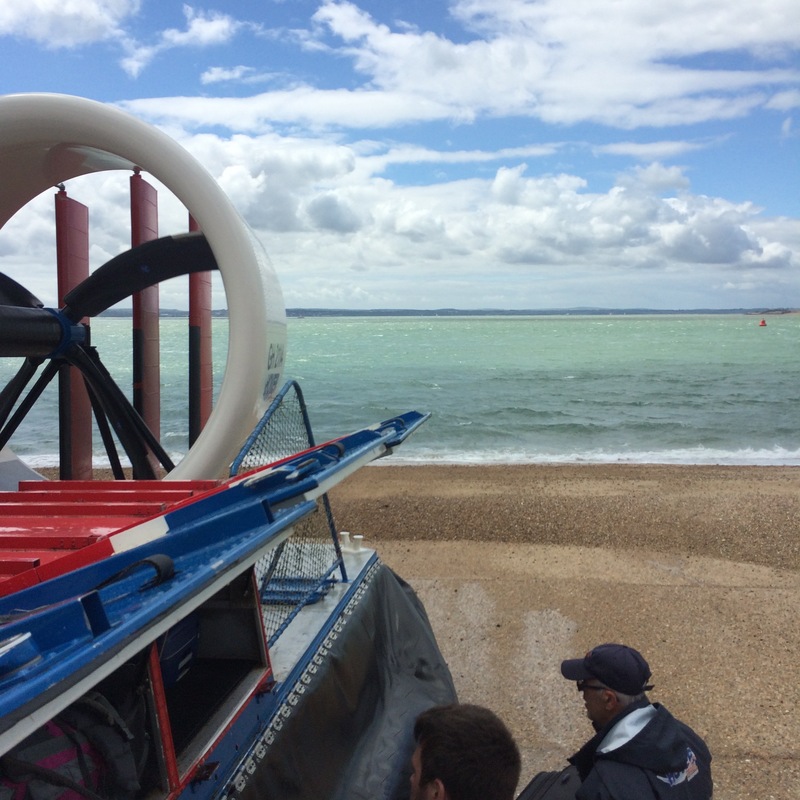 I loved the speed and power of the hovercraft over to The Island (as it’s known to locals) – it made me laugh that the schoolboys behind me were discussing how they’d quite like to die at sea (the crossing was quite rough). I checked in to my B&B for tonight, San Remo, which I’ll return to at the end of this odyssey. I was greeted by the friendly owners Joan and Brian, and their delightful granddaughter, Eva. 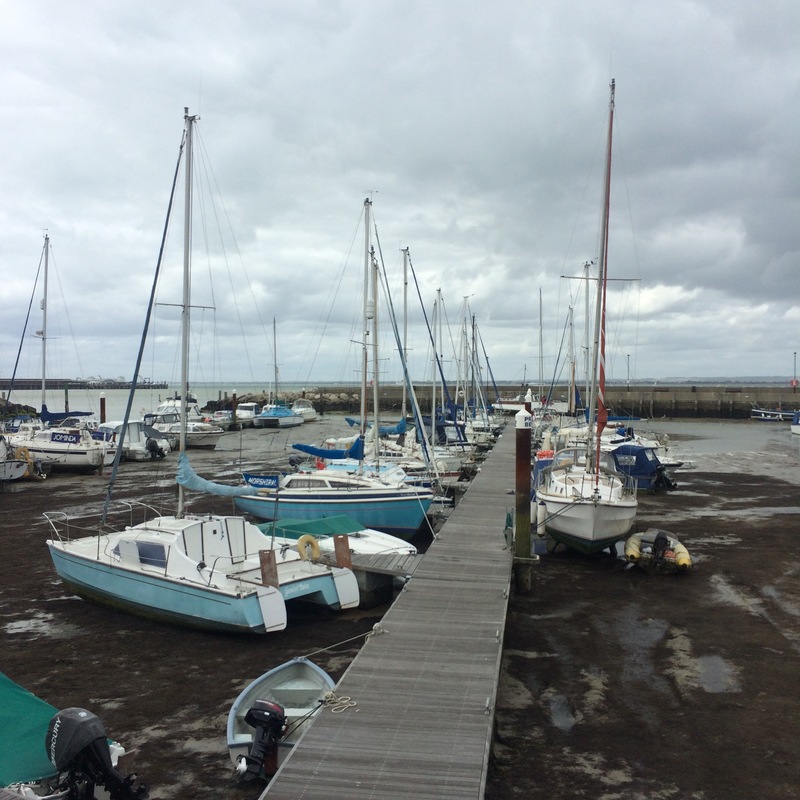 I’ve had a stroll around the harbour this afternoon (here’s my Periscope) as I’m rather partial to the clanking sound of halyards in the wind. They didn’t let me down. 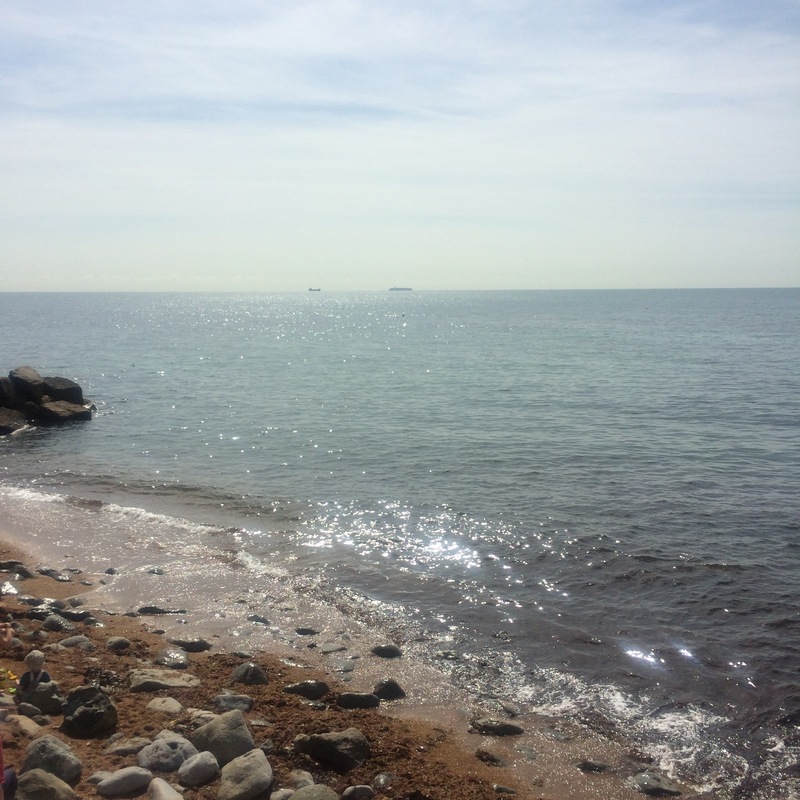 I was rather surprised, however, to spy two naked women striding into the sea while I was filming. Managed to avert my phone camera in time. Good on you, loves. 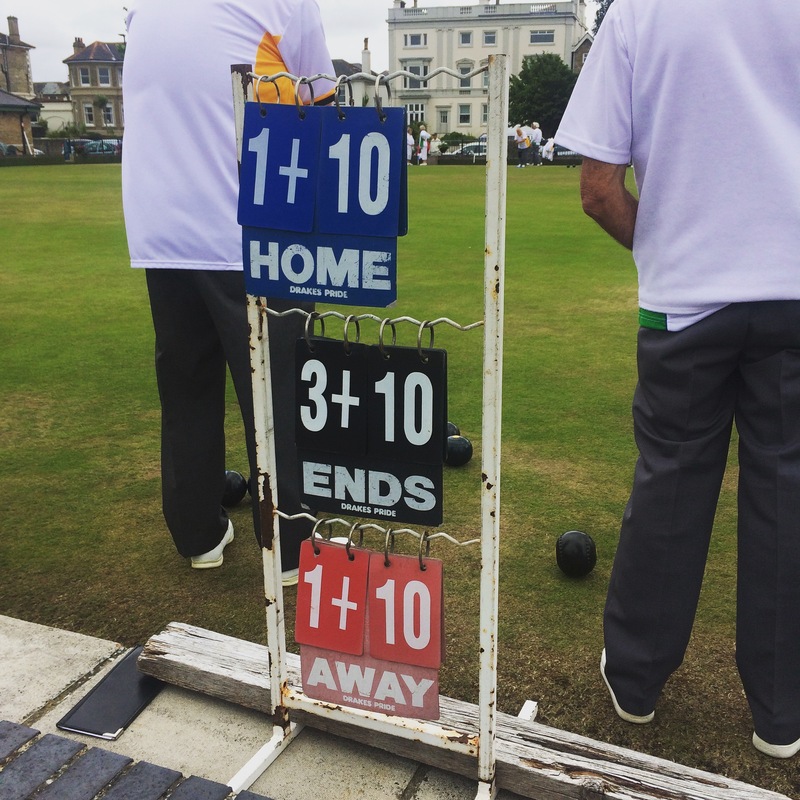 There appears to be a rather healthy bowling tradition in Ryde, with two large teams of players dressed in white on the green next to the esplanade. It reminded me that my Uncle Bruce used to play bowls for Wales. True that. I seem to be absolutely shattered already and I haven’t done any real walking yet. Just heading up to Olivo on Union Street for a huge pizza and then buying some snacks for tomorrow appears to have worn me out. 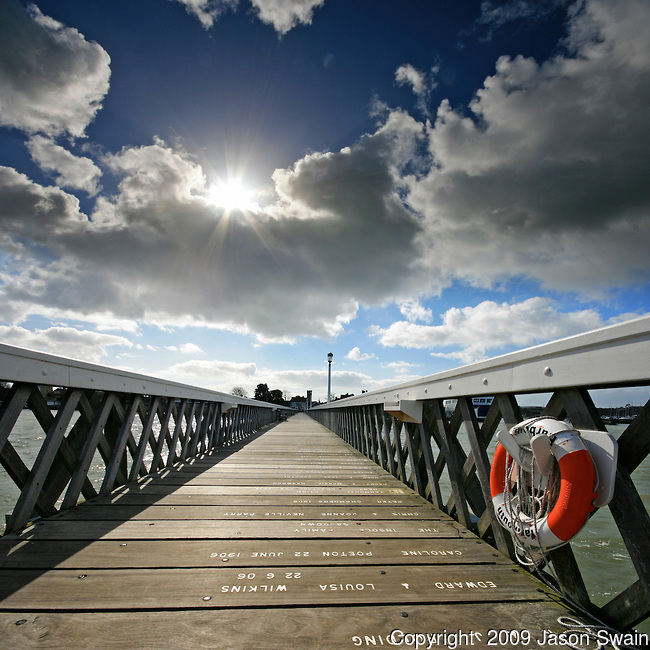 Tomorrow morning will take me to Shalfleet via Cowes, and I’m hoping to look in at Osborne House on the way. I hope you’ll keep me company. 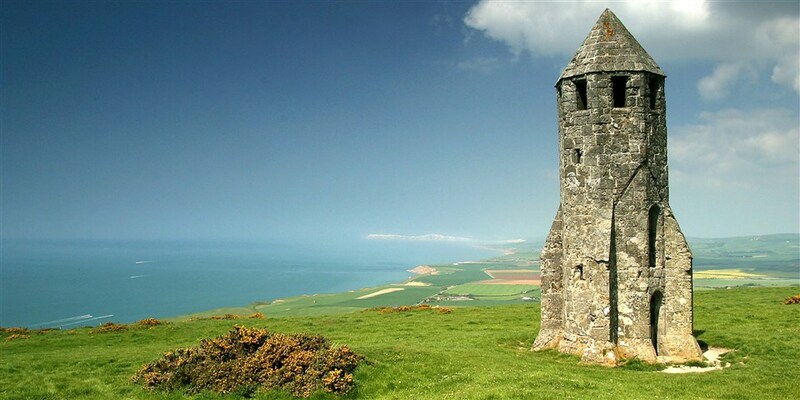 On Monday I’m going to be making my way from London over to the Isle of Wight for the very first time. My plan is to walk the entire 69-mile coastline over the course of four days, and blog about it as I go. I will, of course, be doing it solo. If you’re not from the UK, then let me tell you a little bit about the island. It’s in the English Channel, just off the south coast of England. 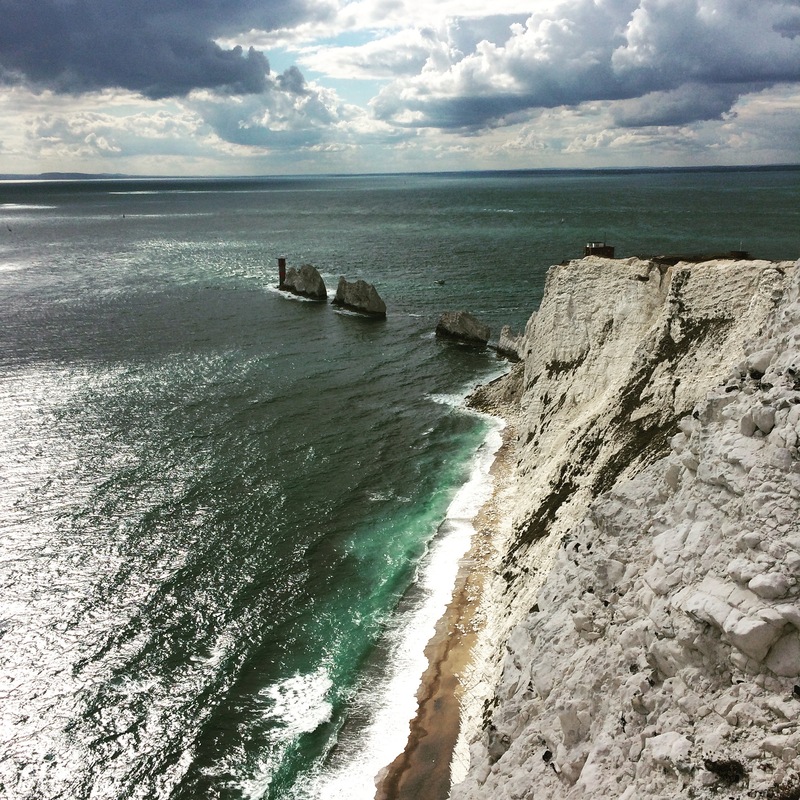 It’s famous for being Queen Victoria’s holiday destination of choice, the world’s oldest sailing regatta, a couple of great music festivals and having dinosaur fossils in its limestone rocks. To get to it you take a ferry or hovercraft from Portsmouth, on the mainland. After a number of years in which I’ve perfected the art of going on holidays on my own abroad, this summer I felt the urge to explore my own country. I’d been reading Robert Macfarlane‘s wonderful books about walking and knew I wanted a walking holiday. I met someone from the Isle of Wight who extolled its virtues to me and thought a coastal circuit would suit me fine. 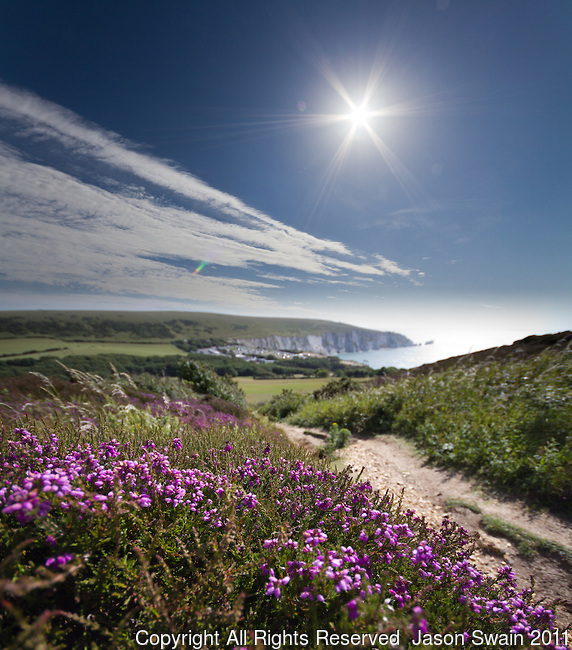 Then I found Wight Walks, who organise everything for you, including accommodation and transporting your bags between venues. Day one is going to see me travel over to the island and stay for a night in Ryde. 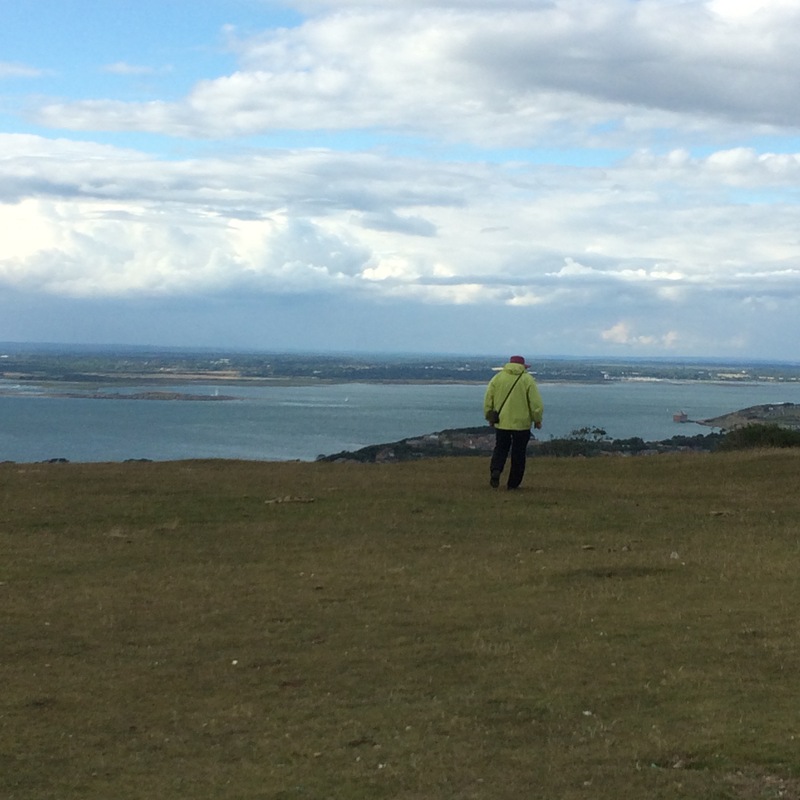 Day two will be the start of the walk, from Ryde to Shalfleet, 16.7 miles. 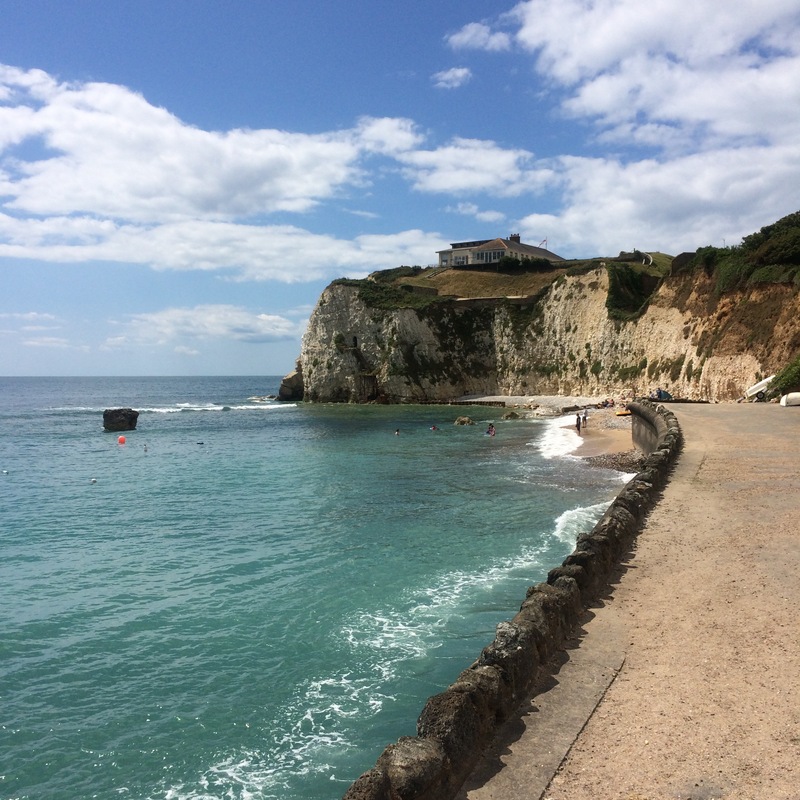 Day three will take me from Shalfleet to Freshwater (16.6 miles); day four – Freshwater to Ventnor (17.6 miles), and day five, Ventnor back to Ryde – 19 miles. Ouch. Here’s the full itinerary. 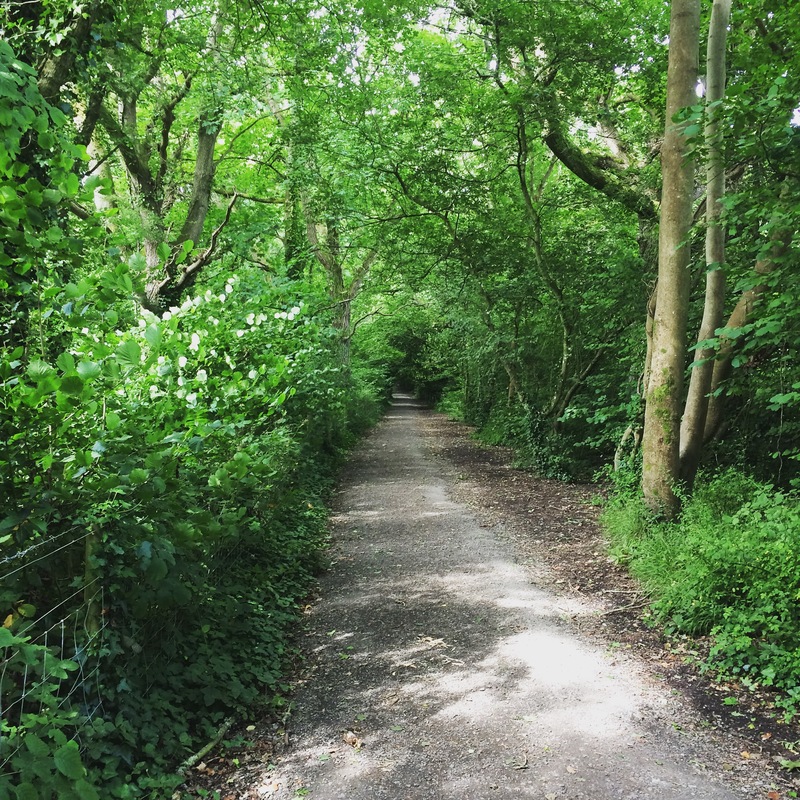 I’ve already blogged about my new-found love for walking, having been inspired by Cheryl Strayed and Robert Macfarlane’s books. I started walking to and from work in the centre of London (about 4.5 miles each way) last summer and now I’m addicted to it. I build in a walk into town on most days, weather permitting, and have started choosing my wardrobe based on suitability for walking. Each walk gives me time to listen to the radio, contemplate things and even dream up new ideas for blogging. They also give me the chance to see some wildlife, as it involves a large canal section, where Canadian geese, ducks and moorhens roam. I need a bit of that in the city. So I’m hoping to be able to Tweet, Instagram and Periscope a bit on the island, even though I’m told the phone signal is a bit dodgy. If it is, it is. I’ll do an update each evening when I find wifi. I’ll be using the hashtag #wightwalk. Looking forward to having you join me on my journey.